Amino acid: a natural chemical that works as a building block for protein. BH4: chemical symbol for Tetrahydrobiopterin, a naturally occurring chemical compound in the body. PAH needs BH4 to function properly. 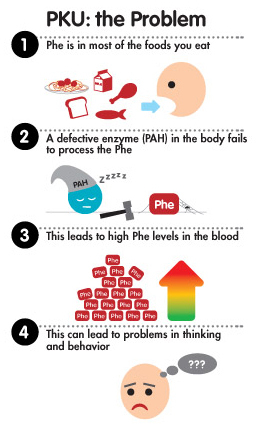 Classical PKU: the most common form of PKU where there are two severe mutations of the PAH gene and as a result, there is little or no PAH enzyme active to convert phenylalanine into tyrosine (phe level in blood: above 20mg/dl). Hyperphenylalanemia (HyperPhe): used to describe those people whose blood phe level is above normal, but still low enough that they may not require dietary treatment (phe level in blood: less than 10 mg/dl). Kuvan: the first FDA-approved prescription drug for the treatment of Phenylketonuria; a synthetic form of BH4. Maternal PKU Syndrome: a collection of birth defects that occur in children born to PKU mothers who did not control their blood phenylalanine levels between 2-6 mg/dl before and throughout their pregnancy. Moderate/Mild PKU: anyone with elevated Phe levels that does not have classical PKU (phe level in blood: above 10-20mg/dl). PAH: short for phenylalanine hydroxylase, an enzyme in the body that breaks down phenylalanine into tyrosine. Phenylalanine (phe): the amino acid that is found in many foods and unable to be broken down by PKU patients. Sapropterin: the generic drug name for Kuvan. Tyrosine (TIE-roh-seen): an amino acid in the body that is used as a building block for several important brain chemicals. Thank you, these definitions were very helpful to the grandmother of a newly diagnosed grand daughte.